As a “house-warming” gift from Sheryl McClure, the present SC of Indiana AHGP we received this list of farmers and their post office addresses for 1878. Sheryl extracted this from the “Names and P. O. 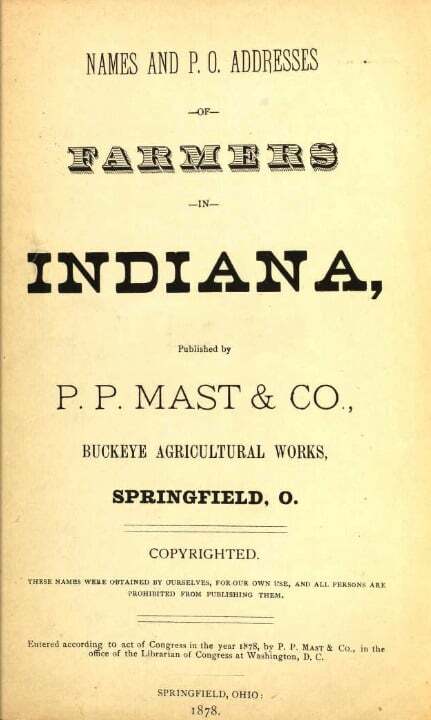 Addresses of Farmers in Indiana” published in 1878 by P.P. Mast & Co., in Springfield, OH. The data is specific to Boone County Indiana only, and lists the names of farmers along with their post office.